This is definitely a book that you can not judge by its cover. Looking at the cover you may assume this is a typical romance novel, but don’t let the cover fool you. I have to admit I was quit surprised at the contents and plot. The author has created a story that has a balanced mixture of romance, suspense and paranormal. The even flow of the plot kept drawing me in to continue reading more. Medium Rare is book two in the Medium trilogy. Rose Ramos has not only inherited a lovely Victorian home, she is also introduced to the family spirit guide, Skag and she also inherited the family talent to see and communicate with the other side. Being a medium with such a willing partner, Rose and Skag start Locators, Ltd.
As with a medium rare dish, many factors come in to play to make the meal satisfying and Meg Benjamin did just that. Starting with a hint of romance and suspense, Rose submits her resume to Evan Delwin, who is looking for a research assistant. Evan has written books on exposing psychic fraud and his interest is peaked after he receives a call highlighting a mysterious psychic by the name of William Bradford. The medium that made the call seems to have conveniently disappeared. As Rose and Evan spend more time together interviewing and investigating William Bradford they seem to have found a fondness for each other. Rose starts to notice that Evan is hot; Evan feels the need to call Rose or stop by to discuss the case, however Rose has been hiding the fact that she is a medium. Will Rose reveal her secret before it is too late? What caused Evan to have such doubt in the powers of mediums and psychics? Now mix in a bit of terror. The author does a fantastic job of building the scary scenes starting with Rose being chased by hellbound dogs and then shortly there after ravens attach her home, later to encounter demons lurking to collect more souls. 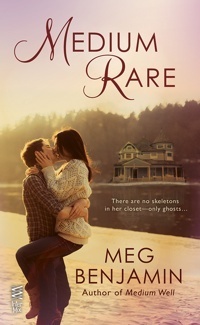 Meg Benjamin really shows her talent for being descriptive, with keeping the plot flowing and building a successful plot with a lot going on but still not too much where it will lose you. The novel kept its interest all the way through. When I first looked at the cover I would have never thought this novel would be packed with such a powerful punch. I am not one to eat my meat medium rare but I have to say this was a satisfying read.